This celebratory book, the seventh in the series, once again pays tribute to the brilliant work top designers around the world have created for a diverse clientele. This inspiring collection provides a wealth of insight for graphic designers and their clients. 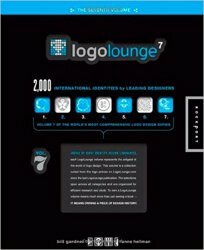 The LogoLounge website (www.logolounge.com) showcases the work of the world’s top designers as well as up-and-coming new talent, and this book presents the site’s best designs of the past year as judged by an elite group of name-brand designers. The first portion LogoLounge 7 profiles ten top designers and spotlights their biggest, newest campaigns. A handful of their smaller projects are also featured in this section along with unused logos that have never before been seen. The second half of the book contains almost 2,000 logos organized by visual categories.